Alhamdulillah, we have finished APCC 2013. Just like TALE 2013 was somehow related to CYBERNETICSCOM 2012; then APCC 2013 was like a continuation of COMNETSAT 2012, when Prof. Byeong Gi Lee suggested the IEEE Comsoc Indonesia Chapter to host the APCC. This suggestion brought us to attend APCC 2012 in Jeju Island, where we won the bid to host the 2013 APCC. It was followed by a series of activities, including event organising and paper management. 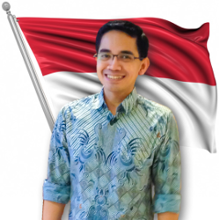 The IEEE Comsoc Indonesia Chapter appointed Dr. Wiseto Agung, an avid scientist an researcher from Telkom Indonesia, as the General Chair of the conference. Another strategic step taken is to arrange a partnership with ITTelkom (now the University of Telkom) as a co-organiser on both the technical issue and event organising. Originally, the number of submitted papers raised very-very slowly. A bit stressed, indeed. But a few days before the deadline, hundreds of paper came through the EDAS. From all over the world, those most educated human beings still chose to wait until the final second before submitting their papers. We collected a total of 309 papers. 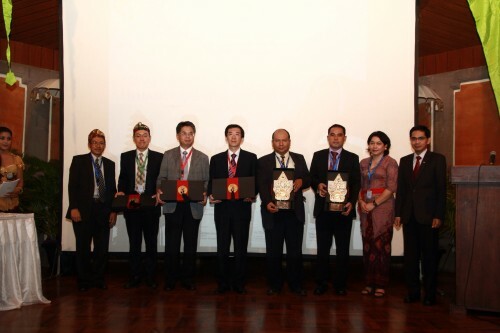 The Technical Program Committee was chaired by Dr Arifin Nugroho, with some vice chairs. The most active TPC vice chair was Dr. Rina Puji Astuti. Meanwhile I held the position of Chair at IEEE Indonesia Section, so I must share my resources (time etc) with many other IEEE activities. The Comsoc Chapter Chair (Satriyo Dharmanto) and the Past Chairs (Muhammad Ary Murti, Arief Hamdani) continued the struggle to succeed APCC 2013. With strict selection process, APCC 2013 passed only 163 papers (53 % of total incoming paper). APCC, Asia – Pacific Conference on Communications, is a very prestigious regional conference in Asia Pacific, which is the region with the highest growth in the world of ICT technology. APCC is supported by the IEEE Communications Society, the KICS in Korea, the IEICE Communications Society in Japan, and the CIC in China. The names of the APCC Steering Committee members are also thrilling: the great figures who pioneered the world of ICT. APCC was first held in 1993 in Taejon, Korea. 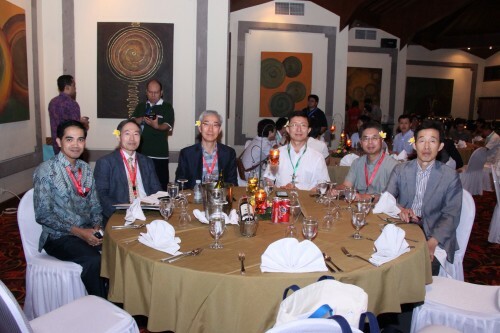 This year, the 19th APCC was held at the Bali Dynasty Resort in Kuta Beach, 29 to 31 August 2013. I had been in Bali since August 26 to attend TALE 2013. The other APCC organisers, from the IEEE Comsoc Indonesia Chapter, University of Telkom, and University of Udayana, has started preparing the event on 28 August. 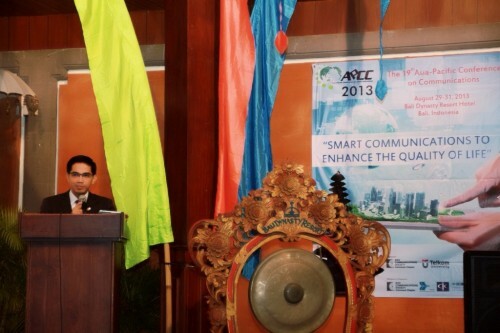 Thursday, 29 August, the APCC 2013 was opened. With a lot of technical sponsors, some representatives had to deliver short speeches at that opening ceremony. But each one took only about 5 minutes. Opening speeches were delivered by Dr. Wiseto Agung (GC APCC 2013), Satriyo Dharmanto (Chair , IEEE Indonesia Comsoc Chapter), Dr. Ali Muayyadi (Telkom University representative), Prof. Zhen Yang (Chair of APCC Steering Committee; Chair of the CIC), Dr. Yoshihiro Ishikawa (Chair, IEICE Communications Society), Prof. You- Ze Cho (Vice Chair , KICS), and yours truly (Chair, IEEE Indonesia Section). 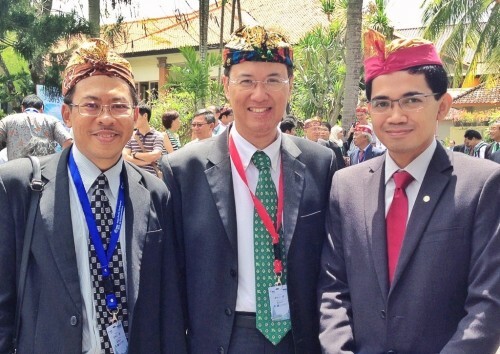 IEEE Indonesia Section itself represented the IEEE as the technical activity endorser. My speech just simply mentioned that Asia Pacific has great significance in the development of ICT. Besides the fact that this area is the center of the most competitive ICT industry, the residents are also among the most adaptive in embracing digital lifestyle in the new culture. Our cultural richness has supported the development of communication technologies, with the ability to understand and support the highly contextual interaction and communications. But the social problems in the region is also alarming. We open access to information technology, but we encourage consumerism. We facilitate the preservation of nature, but we also increase pollution. We help creating new jobs, but we also accelerate urbanisation. The engineers need to design and develop technologies that will address the various issues of humanity and the life of human being. And it was in this social context, that we chose this theme for APCC 2013: Smart Communications to Enhance the Quality of Life . Keynote speeches were delivered successively by Prof. Byeong Gi Lee (Past President, IEEE Communications Society; Past President, KICS), Prof. Adnan Al-Anbuky (Director of Sensor Network and Smart Environment (SENSE) Research Lab, School of Engineering Auckland University of Technology, Auckland New Zealand), Mr. Indra Utoyo (CISP, Telkom Indonesia; Chairman, MIKTI), and Mr. Ichiro Inoue (Network Systems Planning & Innovation Project, NTT). The next activities were typical for any international technical conference. Special speech sessions, tutorial sessions, parallel presentation sessions, poster sessions, etc. In the tutorial session, I chose to avoid mainstream discussions of mobile network etc, and chose instead the sensor network as one of the elements for the Internet of Things (IoT). The tutors happened to be a pair of professors from Coventry University. This is a modern university (compared to classical universities) that gained a lot of appreciation and awards everywhere this year. Another regular event was the Gala Dinner, with its semi-formal atmosphere, but also with its permission for a laugh-out-loud sessions. Here the Paper Awards were also presented by the APCC Steering Committee . The last day, I spent my time to visit the poster sessions. Out of curiosity, I seriously talked to all presenters about the posters presented. It was a way to learn new things while expanding networks. Conversations in the poster session could be deeper and more interesting than the presentation session where time is very limited. I recognised that it was a hard work for the organisers. In the review session on Saturday afternoon, I said that even though the organisers in any events always feel that there are a lot of unforgivable shortcomings, but the APCC Steering Committee and the participants, had personally conveyed their appreciations and positive feedbacks. Good job! The IEEE, Unitel, Udayana University, and all. Great job! This year there will be many other events of the IEEE Indonesia Section. Hopefully all will provide supports as it was for the APCC 🙂 . Thanks, all. So awesome events, and the Internet of Things (IoT) is the topic of my lecture event, senastik, an annual conference and call for capers event, is provided by Informatics Engineering University of Trunojoyo Madura.